Common sense than a completely new coating system ever! ! Perfect mirror, a new plating system ever applied to the silver mirror reaction. Silver mirror reaction is one of the chemical reactions that are also used when making such a mirror and thermos. And ammonium nitrate solution is reduced, such as adhering to the wall of a glass container and silver is precipitated, the reaction I get is like a mirror. 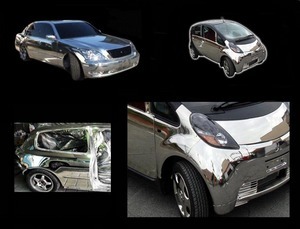 Moreover, plating silver mirror coating technology that using silver mirror reaction (silver mirror coating, paint coating, silver mirror coating, spray coating) are being told. Normal plating until now the construction or use substances such as hexavalent chromium, a major facility was needed, using a silver mirror reaction is a perfect mirror, compact and easy environmentally friendly equipment We provide construction plating system.